Berry Brps. & Rudd can trace its origins back to 1698 when the Widow Bourne founded her shop opposite St James's Palace. Today, the present generation of Berrys and Rudds continue to manage the family-owned business from 3 St James's Street. The Isle of Arran, somtimesreferred to as Scotland in miniature, is a popular destination for holiday makers from the mainland. Arran distillery was built at Lochranza to the north of the island in 1995 and has established itself as a worthy and unique addition to Scoland's distilling heritage. The nose gives some beautifully perfumed fruity notes with hints of melon and grapefruit. The palate is round and sweet, building to release waves of succilent fruit. 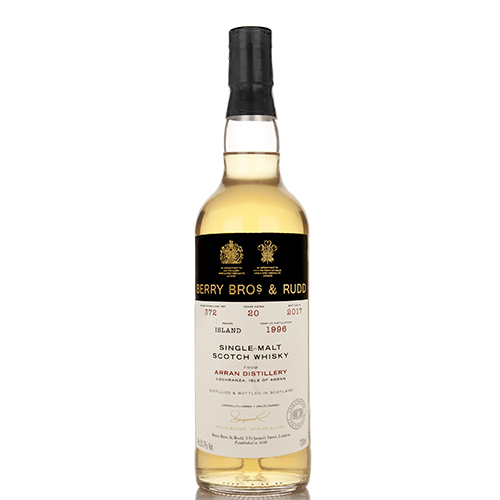 There is a wonderfully teasing balance and complexity to this dram.